Capturing seasonal colour is something I really enjoy – as is working completely against it! 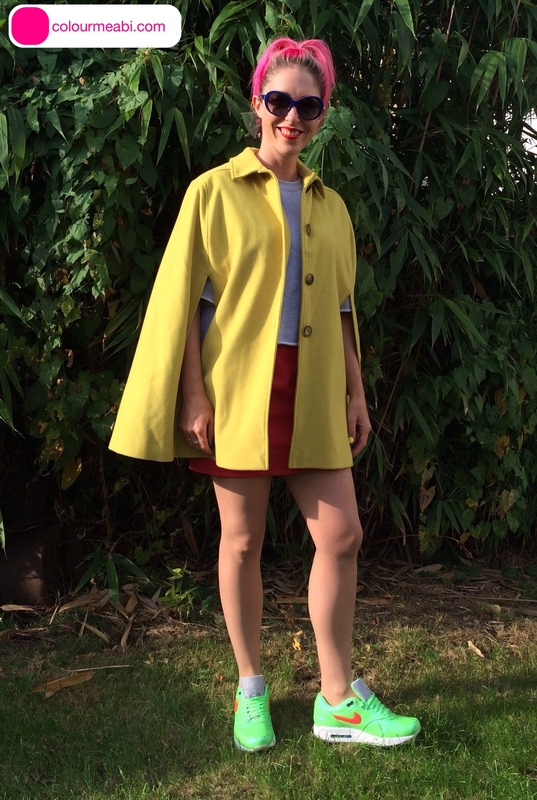 Here I am making the most of the UK’s Indian summer in a red leather-look skirt from ASOS, edit brand ’90s style short-sleeved sweater and yellow Helene Berman cape. As beautiful as the cape is, I feel that that the arm holes would have benefited from a flap to windproof them slightly: any breeze is going to whisk straight through, and with a cape you need all the extra cover you can get. Personally, I also think it’d look better with more finished arms..
On my feet are my current favourite Air Max Nikes: I just love how the orange stands out against the lime on these trainers, and how this gives me the perfect excuse to wear my Mac Morange lipstick on top of a Mac Lady Danger lipstick base (you can learn more about my lippy layering once I’ve written about it!). As of this week the Helene Berman cape and Nikes are both on sale for £98 and £70 respectively, so sign in to the ASOS and Offspring stores and buy up now whilst the going’s still good! Oh – and does anyone actually know what happened to Sunny Delight? !